The BSC Council initiated a fundraising drive in 2013 to establish the Emerging Scholar Prize. Several members of the BSC have already generously pledged their support, and we are happy to announce that a substantial amount has been raised. In order to ensure that the Prize is viable in the long-term, we are looking to raise $25,000 to create a stable endowment. If, after a reasonable amount of time, this is not feasible, monies raised to that point will be used to fund the Prize directly. Should the Prize be terminated, remaining funds will be distributed among the Society’s fellowship and awards programs. The Awards Committee invites nominations for the Marie Tremaine Medal, offered by the Bibliographical Society of Canada (BSC) for outstanding service to Canadian bibliography and for distinguished publication in either English or French in that field. The Tremaine Medal is accompanied by the Watters-Morley Prize, a $500 scholarly award. Eligibility: Members of the Awards Committee or the Council of the Society are not eligible for the award while they are in office. Otherwise the award is open to all, without restriction. Nominations may not be put forward by the president or by members of the Awards Committee, but otherwise there are no restrictions in this regard. A letter of nomination (1-3 pages single spaced), summarizing the nominee’s contributions to Canadian bibliography. The nominee’s CV, including a list of main relevant publications, projects and work supervised. Three letters of support from experts in the field, addressing the significance of the candidate’s contributions. A citation of approximately 750 words about the nominee, to be used as a basis, if the nominee is selected, for the award presentation and for a text to be published, along with the recipient’s response, in the Papers of the Bibliographical Society of Canada / Cahiers de la Société bibliographique du Canada. The members of the Awards Committee are very pleased to announce Pierre Hébert as the recipient of the 2014 Tremaine Medal and Watters-Morley Prize. The prize will be awarded at the Society’s 69th Annual General Meeting. Pierre Hébert, professor in the Faculté des lettres et sciences humaines at the Université de Sherbrooke, has prodigiously advanced book historical research in Canada. He is a pioneering researcher exploring questions relating to censorship in Quebec, and an important contributor to the documentation of Quebec’s book and other cultural producers. 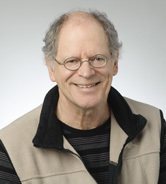 He has supported the broader growth of Canadian book historical research through leadership of major research projects and networks, as well as through an enormous amount of direct research supervision. A member of the Royal Society of Canada, among his many contributions to the community are his current presidency of the Association québécoise pour l’étude de l’imprimé (AQÉI), and co-directorship of the Groupe de recherches et d’études sur le livre au Québec (GRÉLQ), Université de Sherbrooke. We are extremely pleased to extend to Professor Hébert our recognition of his impressive output and career in service of advancing Canadian bibliography and book historical inquiry. The Bibliographical Society of Canada (BSC) invites applications for the Emerging Scholar Prize. The Prize promotes the work of a researcher who is beginning his or her career in the fields of book history and bibliography broadly defined, including the study of the creation, production, publication, distribution, transmission, history, and uses of printed books, manuscripts, or electronic texts. The recipient of the BSC Emerging Scholar Prize will be invited to deliver a paper at the Society’s annual spring conference. A revised, article-length version of the paper will be published in the Papers of the Bibliographical Society of Canada / Cahiers de la Société bibliographique du Canada, subject to peer review. A grant of $500 accompanies the Prize and may be used to help the recipient attend the annual conference or to meet costs associated with research. The recipient will also receive a one year complimentary membership in the BSC. Eligibility: Students of any nationality enrolled in a master’s or doctoral program are eligible (e.g., MA, PhD, MLIS), as is anyone who has completed such a program within the last four years from date of convocation (e.g., teaching faculty, librarians, postdoctoral fellows, independent scholars, members of the book trade). There are no restrictions regarding the topic of research so long as it relates to some aspect of bibliography or book history. One confidential letter of reference, e-mailed directly by the referee. The letter may be given as text or sent as an attachment, but it must include the referee’s contact information and any institutional affiliation. All application materials, including letters of reference, should be sent to Geoffrey Little, Chair, BSC Publications Committee, publications@bsc-sbc.ca, no later than 15 November 2013. Incomplete applications will not be considered. Paper submissions will not be accepted. The recipient will be announced in January 2014. For more information, please contact Geoffrey Little, publications@bsc-sbc.ca. CFP: What Is the History of (Electronic) Books? Author SarahPosted on October 9, 2012 July 9, 2017 Tags Call for papersLeave a comment on CFP: What Is the History of (Electronic) Books? 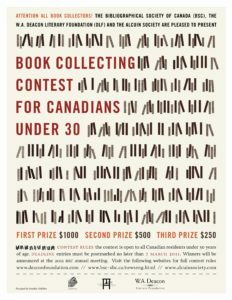 Prizes were awarded to the winning entrants of the third National Book Collecting Contest in Vancouver and Waterloo on May 28, 2012. The second prize winner was David Fernández, of Toronto, Ontario for his collection The Imaginary of Books: Homosexualities, Images, and Texts. 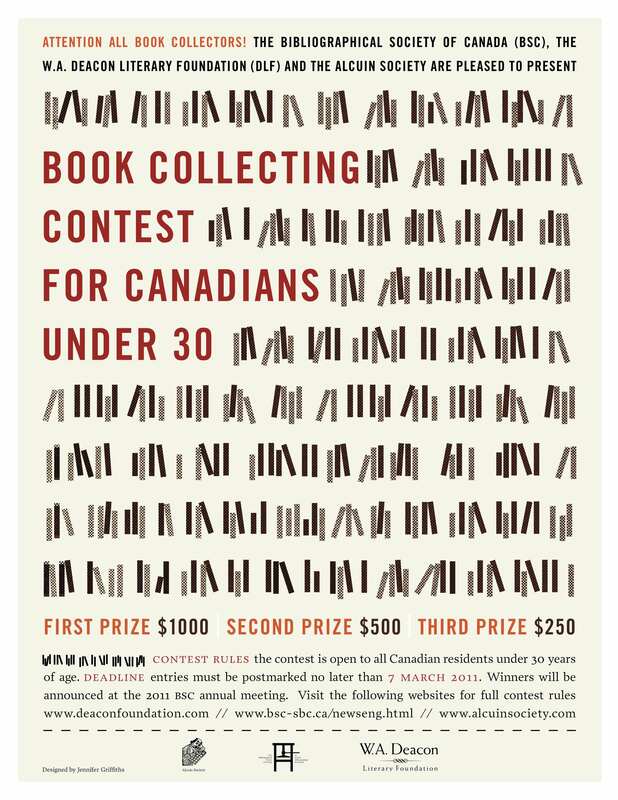 The third prize winner was Gideon Foley, of Saskatoon, Saskatchewan for his collection Tasteful Books.